Wesak is a very auspicious day for all Buddhists. It is also a very remarkable day regarding Lord Buddha. It was the day on which Lord Buddha gave special instructions, It was on this day that water was poured on the Bodhi tree which appeared at the same moment Lord Buddha was born and under which Lord Buddha gained Supreme Enlightenment. 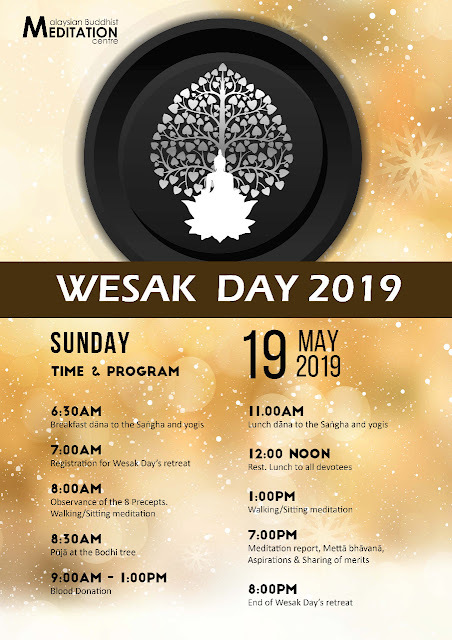 That is why Wesak has been known as Buddha's Day. 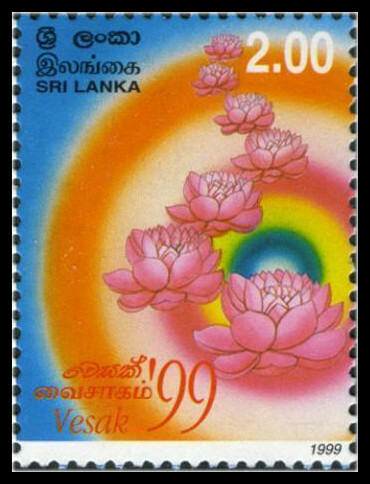 Wesak is auspicious because on this day, the Bodhisatta received a prophecy that he was assured of becoming a Buddha. It was on this day that the Bodhisatta was born. It was on this day that he was enlightened as Buddha. It was on this day that he passed into parinibbāna (the passing out of conditioned existence). That is why the full moon day of Wesak is most revered among Buddhists. What should be specially known about Lord Buddha is that before four incalculables (asankheyya) and a hundred thousand world cycles, during the lifetime of Dīpaṅkara Buddha, Lord Buddha was an ascetic by the name of Sumedhā. He could have attained nibbāna then if he has practised Vipassanā meditation. But knowing his capability that he could become a Buddha one day, he did not wish to attain nibbāna alone but he would want to save beings from the sufferings of saṁsāra. With this noble aim, the Compassionate One went through all kinds of suffering for four asankheyya and a hundred thousand world cycles without caring for his physical body and his life in accumulating perfections or pārami. We should follow the good example of Lord Buddha who sacrificed himself for the benefit of others. 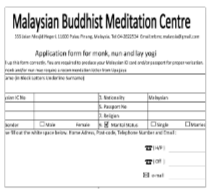 Lord Buddha was born in the year 68 of the Mahā Era, on the full moon day of Wesak, Friday, at Lumbini Park half-way between his father, King Suddhodana's country, Kapilavattu and mother, Queen Maya's country, Devadaha. Holding the branch of a sal tree with her right hand, the Queen gave birth in a standing position. 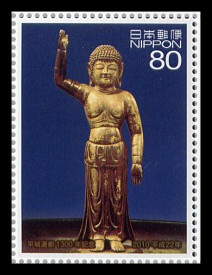 In the year 103 of the Mahā Era, on the full moon day of Wesak, Wednesday, Lord Buddha attained Supreme Enlightenment. In the first watch of the night, he gained the higher psychic power and could remember his past existence (Pubbnivāsa ñāṇa). In the middle watch of the night, he gained the power of supernormal vision and could know what was happening to all beings in the 31 planes (Dibbhacakkhu ñāṇa). In the last watch of the night, he gained Āsavakkhaya ñāṇa, extinguishing entirely all the defilements. At dawn, he gained Sabbaññutta ñāṇa, knowing all dhamma that he should know. 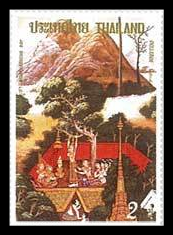 In the year 148 of the Mahā Era, on the full moon day of Wesak, Tuesday, Lord Buddha went into final emancipation (parinibbāna) as dawn was breaking at the sal grove of Malla kings, Kusināra. There was a bedstead where Malla kings sat. 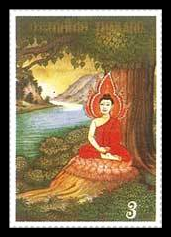 As instructed by Lord Buddha, Ashin Ānanda prepared the bed between two sal tree, keeping the head towards the north. 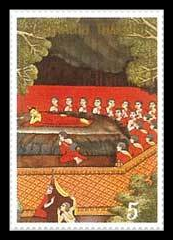 Lying down on that bed, Lord Buddha went into parinibbāna. As soon as he was born, Lord Buddha-to-be, took seven steps to the north and spoke extremely strange words which no one dared to utter. (e) Nathidanipunathbhavoti = I will have no more future rebirths. Bodhisatta spoke for three times at the time of his birth as Mahosatha, Sakka, the king of the celestial realm; as Vessantarā; lastly as Prince Siddhattha.